Book Posts - Taproot — Comic Art Ed! Hello everyone, happy Fall! We're back with a new addition to the book recommendations for young readers, educators + caregivers! Intro: Love and the supernatural intermingle in this exciting graphic novel. 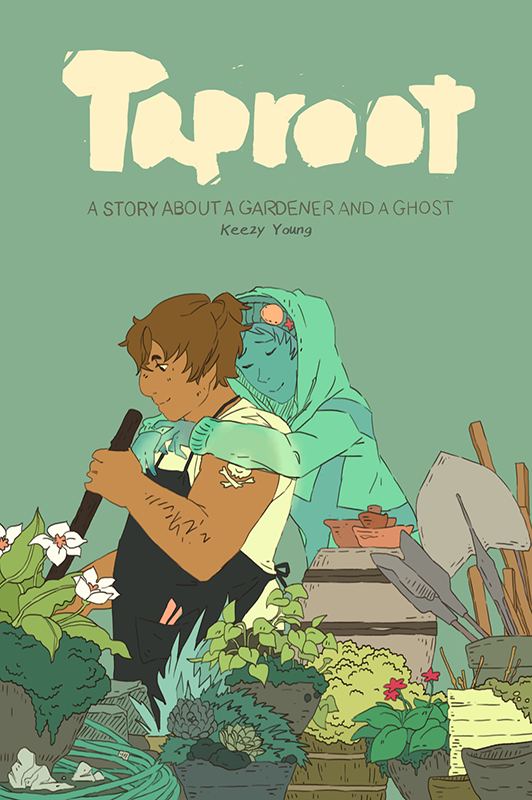 Taproot is a beautiful comic, swirling warm colors and lush environment contributing to the mystery and romance. Story Summary: Hamal can see both the living and the ghost residents in his lush ocean town. They don't bother him too much, maybe bugging him at his gardening job a little. But then they start disappearing. Hamal needs to save his best friend Blue, a ghost who has been hanging around him for a while. The two grapple with their feelings for each other while they try to save each others' existences! Theme 1: The Supernatural. Spookiness is imbedded into every nook and cranny of Taproot. The unexplained is commonplace for Hamal and Blue, who navigate their lives (or afterlife) through a supernatural setting with an immature bumbling that's charming and sweet. Ghosts are everywhere, but so are other creepy-crawlies and magical occurrences. Theme 2: Queer Romance. The push-and-pull romance between Blue and Hamal is as lovely as it is supernatural. Who knew a ghost in love could be so sweet? Disagreements, hurt feelings and deep compassion build the bond between these two main characters. Theme 3: Magical Mystery. Taproot is as much a romance as it is a magical adventure. Problems need answering, but what is happening? Who is behind it? Sometimes the answers are right in front of you, even if you can't see or understand them at first. Should I Read It? : For readers who love romance, creepiness and magical problems, this book is for you! Taproot is a gripping and beautiful read.